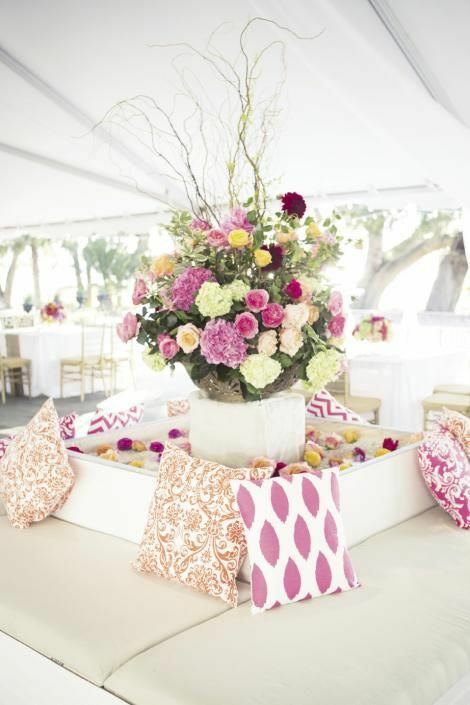 It's easy to become overwhelmed by such a large blank space when you start considering design elements, so the best solution is to segment the marquee into zones; considering your dining area, bar and casual seating, and any areas for dessert tables, cake displays, or buffet serving spaces - depending on your catering options. Once you've established your key zones, it will feel much more manageable when considering your decor options. Marquees generally have a great ceiling height, which can often be forgotten when thinking about decor. Use this space to create atmosphere within the marquee by considering your lighting; uplighters can offer stunning mood lighting into the evening with just a simple change of colour, strings of fairy lights layered either across the whole ceiling, or just across a key area such as the dance floor will create a pretty canopy, and chandeliers will offer that truly luxe feel when suspended above your dining tables. A couple of weeks ago I featured a blog post by Chic Rustique Design, which offered advice from Floral Designer Miriam on how to introduce hanging floral installations into your venue design. These are a perfect example of how to create a stunning feature for a marquee with a blank canvas, and there are so many different ways to do this. Your Florist will be able to suggest ideas for something to tie in with the rest of your floral designs, and Friend of Faux has the most beautiful faux floral garlands which look just beautiful draped across a marquee centre. Papakata offer wooden yew swings which can hang along the centre of their Sperry Tents. For a recent VRW wedding, the swings looked just fabulous with draping foliage and church candles, with hanging tea lights hovering over the central dining table. Unlike a traditional wedding venue, where you might have a series of different rooms to utilise for each aspect of your day, a marquee has one large space where your guests will be spending the majority of the reception (in addition to being outside, whether dependent!). It's therefore important to keep your guests entertained, and continue to introduce little elements of surprise at various points throughout the day. One way of doing so is to offer interactive stations which invite guests to participate in a certain activity (as well as creating a great talking point amongst them). Your guest book is a great opportunity to be creative for this exact purpose. There are so many inventive ways to create memories of your guests for you to look bacon in years to come, and the signing of a book is just the beginning....! Over the last few years, we have created polaroid photo booths, a wish tree, typewriter desk, fingerprint trees, tree slices, and many more brilliant ideas for involving guests! Interactive food stations have been popular for a while, and are a really lovely idea of bringing some excitement to food service. Whether it be a seafood, antipasti, or pancake station, it's sure to get your guests talking and getting involved with the wedding food service. They can also take over a corner of the marquee which may not otherwise be used! Dessert bars are one of my favourite interactive stations for a wedding, and I love designing the styling for these, as well of course as which treats will grace the table top! I say table top, but you can of course be as creative as you like here, and use anything other than a table to create this space - a horse's cart, wine barrels and mirrors have all been utilised at previous Vanilla Rose Weddings to create a dessert space for guests to feast their eyes upon once the wedding breakfast has worn off...! We also created a digestif bar last year, for a Groom who works in the drinks industry, and very keen on his after dinner drinks. This went down a storm with the Gents long into the evening! I hope this post has given you some initial ideas to start feeling inspired for creating your dream marquee space. If you are quite taken with the idea of holding your reception in a marquee, but not sure where to start, we offer an initial consultation service to help you on your way, or a comprehensive planning and design service if you are feeling completely overwhelmed by the prospect of planning such an important chapter in your lives. To find out more, please visit our Services page or contact us.